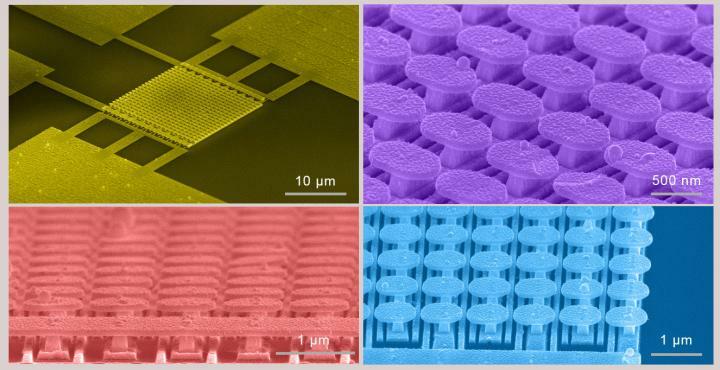 University of California San Diego engineers have made the first semiconductor-free, optically controlled microelectronic device, using metamaterials, with a 1,000 % increase in conductivity when activated by low voltage and a low-power laser. The discovery may lead to microelectronic devices that are faster and capable of handling more power, and to more efficient solar panels. The work was published Nov. 4 in Nature Communications (open access). Semiconductors impose limits on a device’s conductivity, or electron flow, since electrons are constantly colliding with atoms as they flow through the semiconductor. To remove these roadblocks to conductivity, the engineers replaced semiconductors with free electrons in space, similar to how vacuum tubes work. 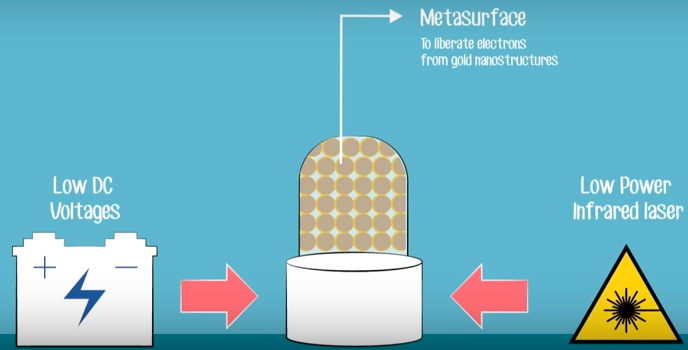 However, liberating electrons from materials is challenging. It requires either applying high voltages (at least 100 volts for cold-cathode emitters), or high power lasers, or extremely high temperatures (more than 1,000 degrees Fahrenheit for thermionic emission) — all impractical in making micro- and nanoscale electronic devices. “This certainly won’t replace all semiconductor devices, but it may be the best approach for certain specialty applications, such as very high frequencies or high power devices,” said senior author Dan Sievenpiper, a UC San Diego electrical engineering professor. The team is also exploring other applications for this technology, such as photochemistry and photocatalysis. These may enable new kinds of photovoltaic devices or environmental applications. This work was funded by the Defense Advanced Research Projects Agency and the Office of Naval Research Defense University Research Instrumentation Program. * The method uses a combination of photoemission (assisted by localized surface plasmon resonances in the near-IR range) and field emission to inject electrons into the surrounding space (vacuum or gas). The intensity of the electric field at the hot spots can be controlled both electrically (with static bias) and optically (with the incoming laser). The vast majority of modern microelectronic devices rely on carriers within semiconductors due to their integrability. Therefore, the performance of these devices is limited due to natural semiconductor properties such as band gap and electron velocity. Replacing the semiconductor channel in conventional microelectronic devices with a gas or vacuum channel may scale their speed, wavelength and power beyond what is available today. However, liberating electrons into gas/vacuum in a practical microelectronic device is quite challenging. It often requires heating, applying high voltages, or using lasers with short wavelengths or high powers. Here, we show that the interaction between an engineered resonant surface and a low-power infrared laser can cause enough photoemission via electron tunnelling to implement feasible microelectronic devices such as transistors, switches and modulators. The proposed photoemission-based devices benefit from the advantages of gas-plasma/vacuum electronic devices while preserving the integrability of semiconductor-based devices.